Join the party of the year with all of your most cherished characters! Koba Entertainment is proud to bring families across Canada Koba's Great Big Show featuring characters from Canada's #1 preschool channel, Treehouse, including The Backyardigans, Max & Ruby, Franklin the Turtle and Mike the Knight™. 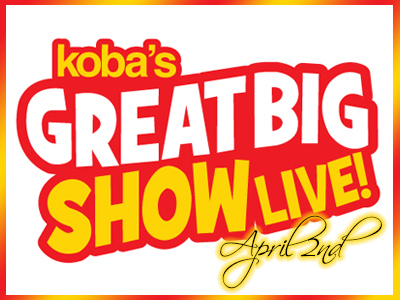 In this unforgettable live stage experience, Koba's Great Big Show delivers inventive musical storylines that showcase over 25 larger than life characters, 25 highly crafted costumes, and 25 original interactive songs, a truly Great Big Show! Koba Entertainment's Koba's Great Big Show celebrates Koba's history of producing quality family entertainment for a global audience. Memories abound as each moment is filled with exciting song and dance numbers perfect for fans of any age!